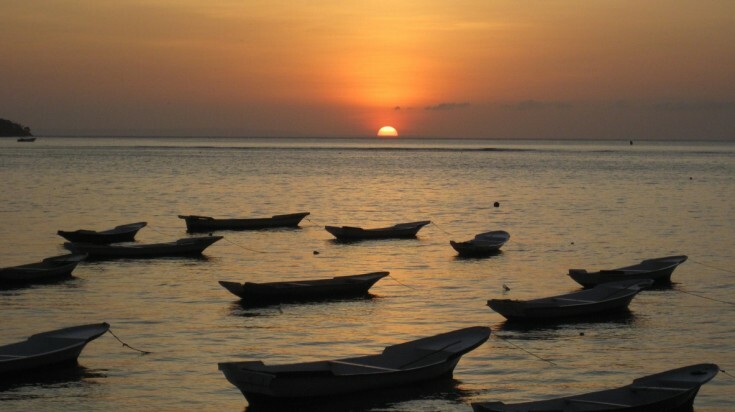 Lembongan island can be reached by boat from Bali. Lembongan Island is a small, lush strip of land set off Bali’s southeast coast. 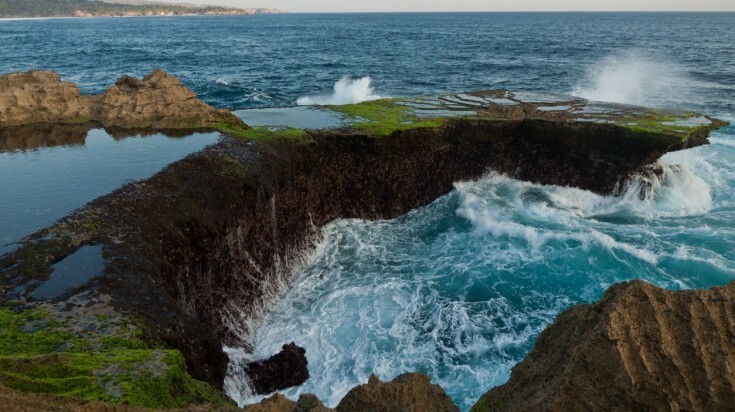 It is one of a trio of islands made up of Nusa Lembongan, Nusa Penida, and compact Nusa Ceningan. The Badung Strait separates the three islands from Bali. On Lembongan Bali, you’ll discover languid white sandy beaches, fabulous snorkeling and diving amidst a myriad of sea life and flourishing coral reefs and serious surfing, all set in a chilled island-type vibe. If you and your family are in search of a more sedate and unhurried pace of life for your vacation, or you are looking for an intimate location for a honeymoon; Lembongan will welcome you with open arms. Best time to visit The dry season between June and September is a pleasant time to visit Nusa Lembongan. The weather is at its best and perfect for surfing, scuba diving and lazing in the sun on the beach. Enjoy one of the many fun activities on Lembongan Island or choose to relax by the sea and enjoy the view. The surf beaches can be very busy during peak season. If you are not a beach person or a water baby, Lembongan Island’s entertainment options can feel a bit limited. It can be wet and miserable during the peak rainy season in January and February. 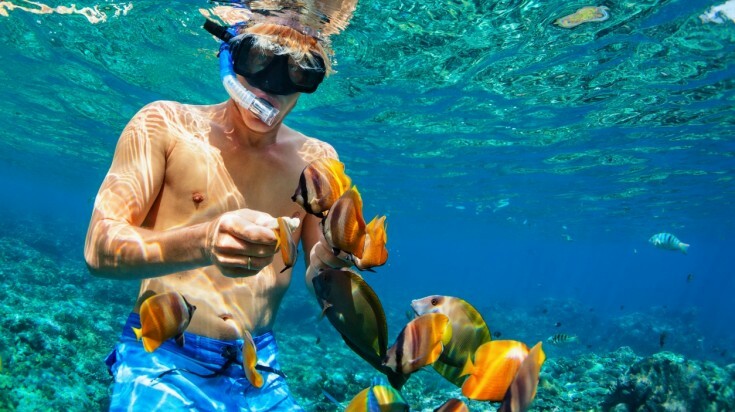 Snorkeling is an ideal activity to do at Lembongan Island. Diving at Nusa Lembongan is excellent thanks to its amazingly clear waters around the island. There are several licensed dive shops on the island. 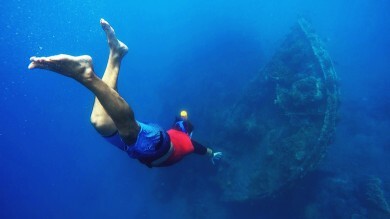 For experienced divers, neighboring Nusa Penida has some fascinating dive sites as well. Here you may experience fabulous drift dives together with easier reef and wall dives. Large manta rays call these reefs home all year round, while majestic oceanic sunfish visit during July to October. Rounding out the marine population are nomadic hammerheads and local nurse and white-tipped reef sharks. Migrating whale sharks have also been spotted here. Finally four turtle species namely the Green turtle, Hawksbill, Loggerhead and the vulnerable Olive Ridley call the waters off Lembongan Island home. Go on a 7-day Bali Island Hopper tour and start the journey by snorkeling at Lembongan island. Nusa Lembongan has its origins as a tourist destination in its attraction as a great surf location. It has long been part of the Bali surf circuit for a while now. There are three main breaks; all sited off the top half of Lembongan’s west coast. A lesser known surf spot is the one off Nusa Ceningan. The Playgrounds, Lacerations and Shipwrecks breaks all lie close offshore and reached either via some energetic paddling from the beach or by a local charter boat. The breaks are more suitable for intermediate to experienced surfers as they all break over potentially hazardous coral reefs. Playgrounds is a more forgiving location for beginners although experts will find plenty to like about its breaks. All the main surf breaks are extremely crowded during the dry season. While surfing conditions are great all year round, the waves are at their very best when the winds come from the southeast quarter, usually from April through to September or October. A Lembongan Island boat trip from Bali takes you west of the island where you dip four to six meters underwater, as you wear specially designed helmets or hop in an underwater scooter that allows you to experience a mysterious and enthralling submerged world, perfect for those who don’t dive. The Underwater Scooter Ride is another great way to explore the corals and marine life near Bali. This activity requires minimum movement as the visitors sit on a scooter and ride through the waters and fishes. This makes it a perfect activity for children and the elderly. The island’s compact size makes it perfect for walking. Visitors should take advantage of the many tracks crisscrossing the island to explore its panoramic coastal views. The south coast’s low cliffs offer some easy coastal walking tracks. From Dream Beach, take the footpath north over the Devil's Tear formation. Here you can see some impressive waves. Brace yourself to get wet! Head towards Sunset Beach and explore the secluded bay. Try to arrive at low tide when you can access the cave at the beach’s eastern point. At the other end is The Beach Club. Stick to the path winding up the hill with the villas on your left, until you come to the cliff line. The spectacular view extends to Bali across the Badung Strait. Take the walking track north before veering to the east, for a view of the majestic coastal formations. Watch out for the delightful sacred kingfishers, which frequent this area, while offshore huge frigate birds patrol the skies. Follow the path eastwards to its end at Mushroom Bay. Much of Lembongan Island’s northeastern coastline has a cover of lush mangrove forest. 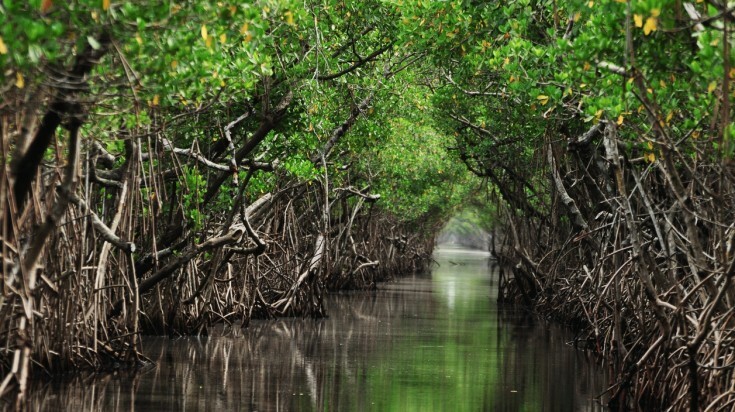 Local boat operators offer tours of the mangrove forest offering plenty of opportunities for wildlife spotting such as nesting birds, lizards and crabs. It is a great getaway from the busy beaches and provides an opportunity to explore the lesser known regions of the island. Lembongan Island offers some sublime beaches. Top up your tan, relax and enjoy the kiss of the sun as you laze on these divine stretches of sand. Check out the gorgeous spots at Sandy Bay, Coconut Bay, Dream Beach or Mushroom Beach for some chill out time or enjoy a refreshing swim in the inviting turquoise water. 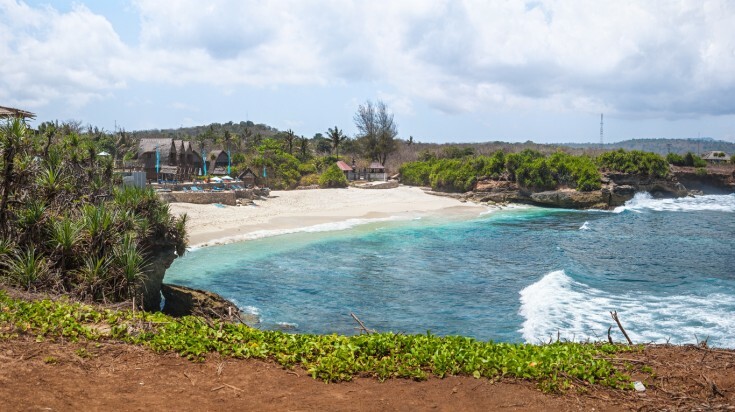 Enjoy time at the beach or go snorkeling during your time at Lembongan island on this 14-day Four Island Paradise tour. Near the spectacular rock outcrop known, as Devil’s Tear is Sunset Beach a secluded bay perfect for relaxing the afternoon away under the palm shades. Onsite is a beach club where you can enjoy the spectacular sunset armed with drinks and comfy with loungers. Finish off a tour to Bali and its neighboring islands by spending a free day on Lembongan island with this tour. Lembongan Island is half an hour away from Bali by boat and you can visit the other islands on a speedboat. Bali together with striking sunsets. There are limited ATMs on the island and most are not available all 24 hours. You can rent a bicycle or scooter to get around the island as there are few vehicles on Lembongan Island. You can walk across a scenic suspension bridge to the small neighboring island of Nusa Ceningan. Drugs can be a problem on the islands. Indonesia has strict drug laws, so avoid temptation! Whether it's a romantic getaway, the lure of crystal water and a thriving reef ecosystem or the siren song of a surf safari; Lembongan Island offers a change of pace from Bali’s hectic lifestyle. On Lembongan, there is no traffic snarls or hawkers to disturb your tranquility or distract you from the delightful scenery. Just put your feet up, relax or enjoy the sand sun, surfing, snorkeling and world-class diving.